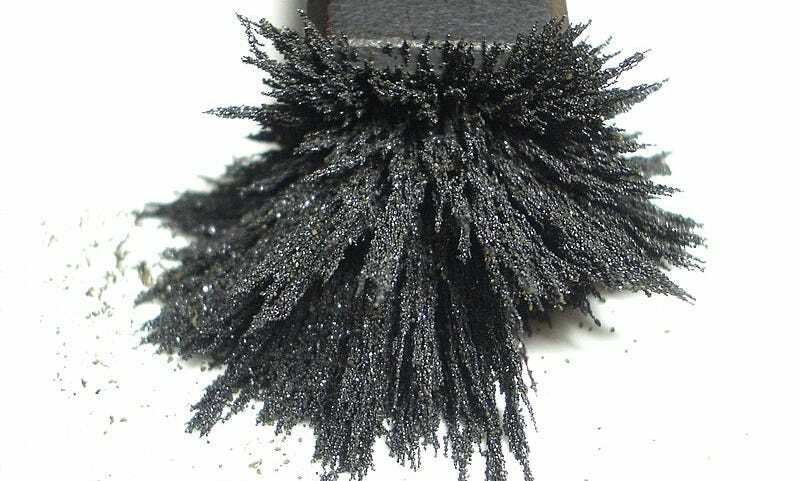 Magnetic Refrigeration is a Real Thing. Here's How it Works. One day we might be able to make home refrigerators without any chemicals or industrial coolants. The main hope for this comes from a special property of metal and a quirk of entropy. We all played with magnets when we were children. We’d get stick magnets on big pieces of metal, or use them to pick up small pieces of metal. While we were doing this, we were inadvertently heating those pieces of metal up, and not just because we were holding them in our hot little hands. Magnetic fields really can cause metals to heat up—it’s called the magnetocaloric effect. When a piece of metal sits, alone and uninfluenced, its electrons spin any which way. When a magnet comes near, and the metal falls under the influence of a magnetic field, the electrons line up their spin so it’s entirely in the same direction. That’s a loss of entropy, or, looked at another way, it’s a constraint placed on the electron’s free movement. The constraint isn’t total. Electrons aren’t free to spin any way they please, but they can move other ways. In this case, entropy increases by allowing the atoms themselves to vibrate a little more violently. The vibration of atoms is more commonly known as heat. Apply a magnetic field to piece of metal, and it will heat up. The effect is moderate in most metals, but some, such as gadolinium, really warm up. This sounds like a good way to cook food, not to cool it, but the magnetocaloric effect works both ways. If a piece of metal is under the influence of a magnetic field, and the field is taken away, the metal cools down. Most magnetic refrigerators currently used in labs to cool small objects use this method. A substance, usually helium, is applied to the metal while the metal is under a steady magnetic field. The substance carries away the extra heat, the metal cools down, and then the magnetic field is taken away, making the metal especially cold—cold enough to be used as a cooling unit. Magnetic refrigeration has been around for a long time, but household use is still but a long term dream. The fact that a magnetocaloric cooling system looks like it could be efficient, quiet, and require fewer chemical coolants, means that it is a cherished dream. Top Image: Aney. Second Image: Ryan Somma.